So, yeah. Rachel Dolezal has a new documentary coming out on Netflix, “The Rachel Divide.” Cue gag reflex. My eyebrows legit met my hairline when I saw this story. I thought about it, but ultimately I can’t get my back into a blog denouncing Netflix as a heretic for airing this misguided pathetic-ness. At the end … Continue reading Why Won’t Rachel Dolezal Go Away? The Interview, the comedy starring Seth Rogen and James Franco, has been yanked from theaters following the now well-publicized leak of emails from Sony Co-chairman Amy Pascal and others. There are three important things we can all learn from this communication debacle. 1. Nothing is private. If you think anything affiliated with the internet is private, don’t kid yourself. If someone built it, someone else can hack into it. Period. It’s best to operate under the assumption that there is a clear glass wall between what you write on the ‘net, what you say in public – and occasionally in private – and the entire civilized world. So, keep it classy. Congrats to Lupita Nyong’o for becoming Lancôme’s first Black spokesperson. The world should celebrate black beauty. It is as common as any other kind, after all. And congrats to Lupita for riding a very elegant magic carpet of success all the way to the top. I’m not sure there was an award she qualified for that she didn’t win this past award season. And damn did she look good every single time anyone saw her! Lord have mercy she was fabulous! Not because she was runway ready but because she owned every scrap of fabric that graced her body. She was proud. She was different, and she quite obviously could care less. Every graceful line of her body seemed to wink and say, yeah, I know. She looked in the face of traditional definitions of beauty and had a big ole belly laughter, and seemingly everyone – certainly every big name in Hollywood who rushed to shake her hand and offer congratulations – laughed right along with her. 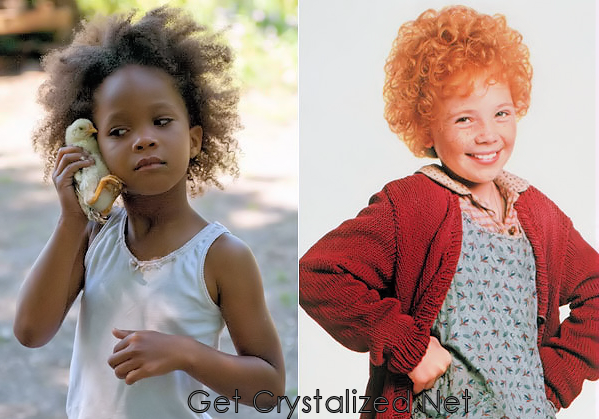 So Quvenzhané Wallis is playing Annie, and as the moment of truth – also known as the film trailer release came and went – there has been a ton of, um, concern from people who are confused and chagrined the nine year old African-American is playing the iconic role.